I tried this over Xmas and LOVE IT! I use it as a sub for my FSG (which I use as a curl enhancer, really) while traveling since traveling with a perishable hair product doesn't really work. It was GREAT!!! I'm really happy with the results! I think it may become a regular product for me! It's very much a jelly, which works well for clumping, etc. I do use gel over it, however, but I'd guess many curlies wouldn't need to! It is one of my HGs! I love it! Really, Juana?? Everyone else seems to use the smoothie. Have you tried it? Is it indeed "curl enhancing"? In tempted to pick some up now, after having such luck with the soufflé!! I use both. It does enhance my curls. I use it as more of a refresher during the week, sometimes as a DC/prepoo. Darn it. Add another product to the PJ list. Lol! I keep seeing it and am tempted because my hair likes FSG but I'm worried about it weighing down since I have that issue with some of the SM line. I will wait until the weather warms up. I've used both. They are very different products for me. The smoothie is more of a cream instead of the jelly-like consistency of the souffle. My hair is fine and while I like the smoothie, I have to use a really light hand or it is too rich for me. I do like it as a DT. I prefer the souffle for regular use. After my RO, I rake in either the souffle, LOOB or EcoStyler Krystal. Scrunch with either FSG or LALS. All depends on the weather and my mood. Still don't think I've found the "perfect" combination but I like the results. HGs: FSG, anything with glycerin, Tresemme Naturals conditioner, Curls Like Us cloths, satin pillowcases. Jas, I think we might be very similar in hair properties and types. I can't tell for sure your curl pattern from your pic, but I'm wondering how you apply your soufflé? I've got the smoothie, and it really works well for me. Mom to a straight and a curly. "The Longer the Hair, the Bigger the Blob." Porous, very dense but fine hair. Medium everything else. Miss Jessie's Pillow soft curls, diffuse 50%, add KCCC and diffuse to 80%. My patten is mainly 3a, but there is some 2c and some 3b in there, too. After my shower I do LI, then seal, then I scrunch in some soufflé, then gel. If I use FSG it's in place of the soufflé. Also, I find the soufflé to be very light and not add any weight! Btw, does the smoothie have any type of hold? Or is it just a leave-in, essentially? Would it be good for SOTC? What does the product say it's actually used for? I only used the Smoothie a few times. I don't think it really had any hold- I used it as a curl cream/enhancer underneath gel. I don't find the smoothie very moisturizing. I have fine hair so I had to use it very sparingly as a sealer with my li underneath. I have a very strong curl pattern so hold really is a big issue for me so I didnt use a gel with the smoothie. I need this fsg recipe. I use KC spiral spritz and it has zero hold. It was expensive enough I feel I must use it until I buy something else. Your hair sounds like mine, I have 2c/3a on top layers, 3a under the top layer, 3b pieces underneath the rest. My hair is finer but I have a lot if it, if that makes sense. As for hold, there is none, but I bought the hold and shine spray to match the smoothie yesterday, quite a good hold on that. I like it. Are you also porous?? If so, you are basically my identical hair twin! Everything else - down to the exact curl pattern - is right on!! I posted my latest FSG recipe not that long ago. It's pretty protein heavy, tho, so you'd have to like protein. I thought I didn't like protein, but I'm wondering if I need to rethink that. I have very porous hair, its highlighted, too. I am still new to this whole CG thing so I really need to get a CG cut, as it's all one length right now and very weighed down. I'm still trying to figure this all out and how ot make it look good. Porous, too??? HELLO, HAIR TWIN!!!! Most porous curlies do like protein. My hair never met a protein it didn't like, but some find their hair has protein types that it doesn't respond well to. Whatever protein you use, if you are doing a PT you should pretty much always follow up with a moisture DT. Have you tried the gelatin PT? My hair adores it! That's why I added so much gelatin to my latest batch of FSG! I've not heard of the gelatin PT? What do you use as a DT? Im not good with all the abbreviations yet. I bought the L'oreal ever sleek or something, little tub that's bronze-ish after watching the waterlily girls youtube video about best conditioners. I dont know though. How do you do a DT? do you do heat? I need a step by step rundown. I'm totally clueless. 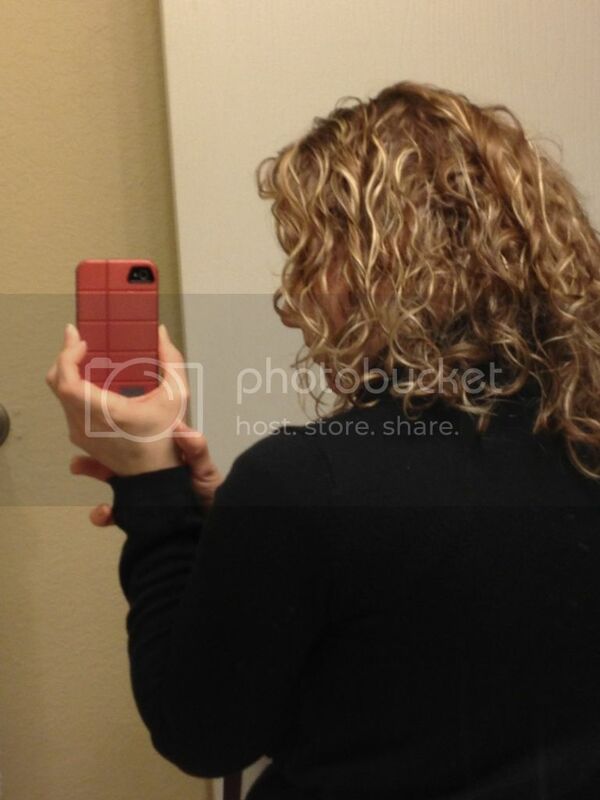 I need to see a pic of your hair, I cant tell very well from your profile. The gelatin PT is magical. Lol! My hair adores it! Basically you use a packet of unflavored gelatin, and I add some ACV (apple cider vinegar), a little coconut oil, a little Epsom, and sometimes a little honey. Put it on my cowashed and detangled hair, then put a bag over it. I run that under the hot shower for a few minutes, then rinse it out. I'll add a strong RO or DT, then rinse and style as usual. For a DT, I typically just use my RO, and add EVOO, honey, and a splash of ACV. As far as procedure for a DT - if I can add heat I will. Sometimes I'll leave it in overnight. Most often I don't have a lot of time to do that sort of thing, so I just do it in the shower while I shave or something. Another option is a pre-poo treatment. I'll use condish and/or coconut oil and put that in my hair about 15 mins before I am going to shower. (I only do this if its a low-poo or clarify day). You can get a good treatment in that way, too! I've done that overnight, as well, and just poo'ed in the morning. doing the just conditioner today. I'll try to post pics of how it turns out. It's not for me to use alone just like FSG. I thought it might be a KCCC dupe, but it's definitely not, KCCC has slip and I have to use way less. Overall I like it ok, but I really hope I can find KCCC soon. Idk why my Target hasn't restocked it since summer it seems. I'm wondering if mixing a little of this with even less of the smoothie would work well. The smoothie is next on my list to buy - because why stop now? Lol!! Funny, my hair **hated** this stuff!! I only tried it twice, but it left my hair dry yet greasy at the same time. I don't know if my hair hates aloe (this is the first product I've used with aloe in it), or if maybe I used too much. I felt like it coated my hair and refused to dry, but at the same time left my hair feeling like straw... could that be aloe? Either way, I'm reluctant to try it out again! It does smell lovely, though. I definitely feel like there's a learning curve for me with this. I am also having issues with my hair feeling very dried out, but I have very agreeable hair and don't have an issue with any of the ingredients (of course the dews this morning were -7, so it could just be that my hair hates the cold). I'm not too concerned yet- I'm cutting off most of my length next weekend, so I have no idea how that will change my product choices. Corinna!! Chopping it all off?? How short? What type of cut?? I thought my hair was going to feel dry, but then it was fine. Had a ton of LI and oil, though. I normally seal with MO, but the past week or so I've sealed with Vo5 hairdressing, which has MO in it, and I've had GREAT luck with it. So perhaps it's the combo of the two together. Here again I wonder if the smoothie used with this might be beneficial? Idk. I'm getting a curly bob, hopefully between lip and chin length. I'll probably start growing it out again right away, but I've been really curious about what a shorter length would do to my curl pattern. I can't wait to see pics!!! I keep wanting to do a curly bob, but I don't know how my curls would react, and I'm worried it would become higher maintenance - which I certainly don't have time for right now. OK, here it is today. Really curly, tight curls. I did con dish, waited, co washed, some oil and conditioner on the end half. Then shea smoothie, the shea spray, and plop. I plopped for like an hour which is the longest I've ever plopped and man, I think it helped. There's just some spots where it kidn knotted up at the roots, you can see where it's a little strange if you look at the roots in the pic. I am not sure how to add a pic, hopefully this works. HOLY CRAP! That is HUGE! lol! Nice!! How are you plopping? What I mean is are you applying products, etc upside down first? I don't turn upside down until I plop. I rinse, comb out, etc right side up, but leaning my hair forward slightly. When I'm out and scrunching in product I tip it slightly further forward, and side to side slightly, especially as I use a towel to scrunch out the excess water and product. Then I gently turn it upside down onto the plopping towel. I have found if I do other things upside down my clumps fall apart more and I tend to get more issues at the roots, like what you were describing. I do "loosen" the roots at the end of my shower, and gently a little more just before the plop gets wrapped.